As we finally (hopefully!) start to leave winter behind, I thought it was time for a spring installment of FR Faves. Just a round-up of some of my favorite things to help ring in warmer weather! First up, are these beautiful silhouette bracelets from Von Jet Silhouettes. You may know Von Jet from their gorgeous wooden wall silhouettes, but did you know they have a full jewelry line? They offer necklaces and bracelets in various styles and sizes. I chose a gold Cut Charm Bracelet in the "tiny" size for a more understated look. But you can go big, add birthstones or initials...the sky's the limit as far as personalization! These are a great way to wear something meaningful that will also become an instant family heirloom. Plus, they make great gifts...for yourself or someone else who loves your kiddos as much as you do (I’m lookin’ at you, Grandmas)! Country Pear by Antique Candle Co.
Now that we're leaving the dregs of winter behind us, I'm also ready to ditch the dry, lackluster winter skin. Enter Josie Maran's Argan Illuminizer! I was looking for a good everyday highlighter -- one that says "youthful radiance," not "heading to the club to dance the night away." This is the one! It gives you a beautiful, subtle glow that looks natural and is buildable if you want a little more shimmer. It's also very moisturizing without clogging pores...perfect for all skin types, even super sensitive like mine. Win-win! I first started using wet/dry bags when my kids were babies. But they've grown up with us and have since become a staple when we go on trips, in the car, etc. On vacation, I keep one in my purse or tote bag to corral the 12 pounds of wet seashells we're bound to collect, sandy flip-flops or shirts that have had unfortunate run-ins with bright red slushies. For everyday, I keep one in the back seat of my car just in case. 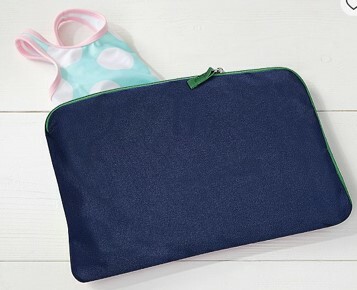 These bags are great because they keep messes in and they're easily washable. Pottery Barn Kids always has great options in solid colors and super cute patterns!